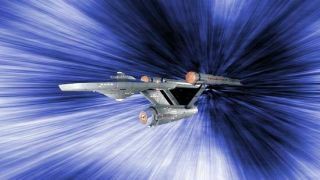 Star Trek's faster-than-light warp drive is an idea that even serious scientists don't want to let go of. The biggest challenge in mounting a space mission to another star may not be technology, but people, experts say. Scientists, engineers, philosophers, psychologists and leaders in many other fields gathered in Houston last week for the 100 Year Starship Symposium, a meeting to discuss launching an interstellar voyage within 100 years. "It seems like it would be so hard, and the biggest obstacle is ourselves. Once we get out of our way, once we commit to this, then it's a done deal," said former "Star Trek: The Next Generation" actor LeVar Burton, who is serving on the advisory committee of the 100 Year Starship project. But Burton wasn't the only one who said the most difficult part of interstellar spaceflight may be corralling public and governmental support, and getting the right thinkers to work together to attack the problem. "I think the greatest challenges are going to be what the greatest challenges in anything are, and that's the people piece," said former NASA astronaut Mae Jemison, who was the first African-American woman to travel to space. Jemison is heading the new 100 Year Starship organization, which was founded with seed money from the Defense Advanced Research Projects Agency (DARPA). "The really exciting thing and the scary thing is I know I can't do it by myself, but there are a lot of people who want to help," Jemison added. Interstellar spaceflight for humanity isn't inevitable, she said — merely imperative. "We could screw it up," Jemison told SPACE.com. "We could decide not to do it. But I can tell you what, if we don't figure out how to do it, then we probably aren’t going to be around to worry about whether the sun turns into a red gas giant. Unless we find some focal aspiration that pushes us further, that helps us see ourselves as a species that we should be cooperating with, we're going to be in trouble." Plus, if human beings can solve the challenges of interstellar spaceflight, in the process they will have solved many of the problems plaguing Earth today, experts said. For example, building a starship will require figuring out how to conserve and recycle resources, how to structure societies for the common wellbeing, and how to harness and use energy sustainably. "If we are going to evolve to our next level of being, we will need to solve all of the problems here on Earth that need to be solved in order to get off of this Earth and to another star system," Burton said. "Everything that we do in order to make that a successful reality will be applied to our life here on Earth. The solving of these problems along the way is the reason why we want to do this." et some of the people involved in the 100 Year Starship initiative say they face an uphill battle convincing the outside world that the project is serious, and that it's not a bunch of science fiction fans simply trying to build a real-world Starship Enterprise so they can try warp travel. Astronomer Jill Tarter is no stranger to that problem. As co-founder of the SETI (Search for Extraterrestrial Intelligence) Institute, Tarter is used to people mistakenly dismissing her research as a wacky scheme to hunt for little green men. "When Mae asked me to be part of this, obviously I was predisposed in terms of scientific interest, but I wondered if I would be bringing all this negative baggage that she didn't need," said Tarter, who is serving on the 100 Year Starship advisory board. "But in the end I decided, nope, I think we can both benefit by simply standing up and continuing to audaciously announce that what we're doing is really valid exploration. If you say it long enough, people finally get the message."